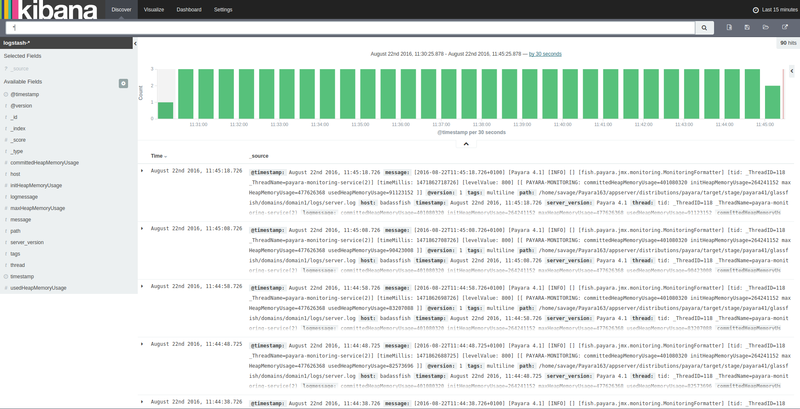 When Payara Server has been logging monitoring data to the server log for a short while, the metrics that Logstash outputs to Elasticsearch can be visualised using Kibana. In this blog post, we will create a date histogram displaying used heap memory as a percentage of the maximum heap memory. 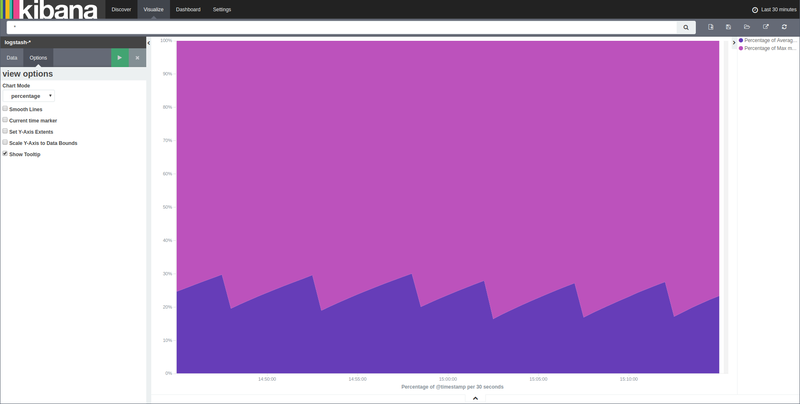 With that done successfully, Kibana is ready to start tinkering with! Note: If the dialogue isn't loaded then you can configure index patterns by clicking Settings, then Indices. The Discover tab can be used to explore indices, view select fields, and filter out events with a timestamp not within a specified period (or periods). 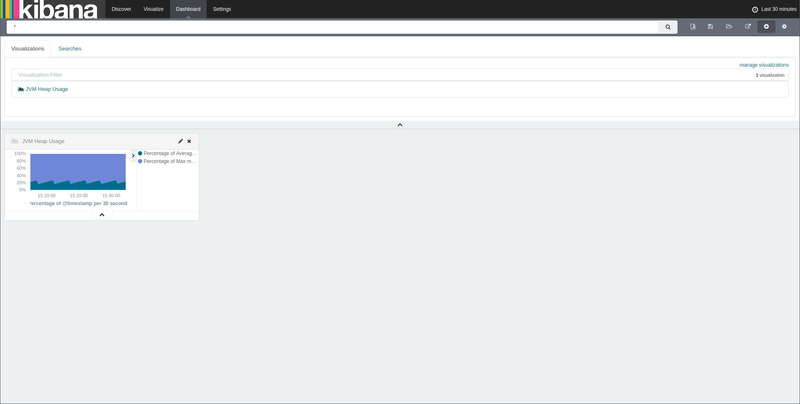 By default, it will show data from all indices (using the wildcard *) and display the _source field. Fields can be selected along the left, while time filtering can be done by clicking on the clock icon in the top right corner of the page and using the dialogue shown. 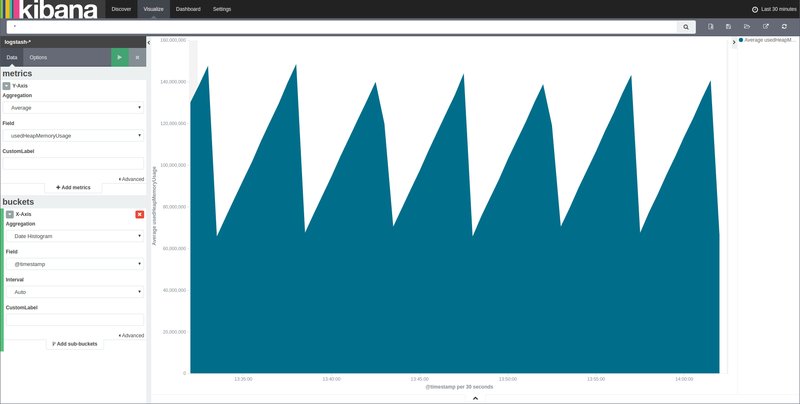 To get an area chart visualisation to show, Kibana must be provided with an X axis aggregation. Selecting the X-Axis option in the 'buckets' dialogue will provide a list of different aggregations available. Set it to 'Date Histogram' and change the field to be used to @timestamp. The result can be previewed by hitting the green 'Play' button, although it won't show a useful result yet. Next the Y-Axis metrics must be set up. To set up the first metric, expand the existing metric by clicking on the button to the left of it which should make the available aggregations visible. The default aggregation, Count, is the event count for each bucket. Changing this aggregation to Average will allow for the selection of fields. 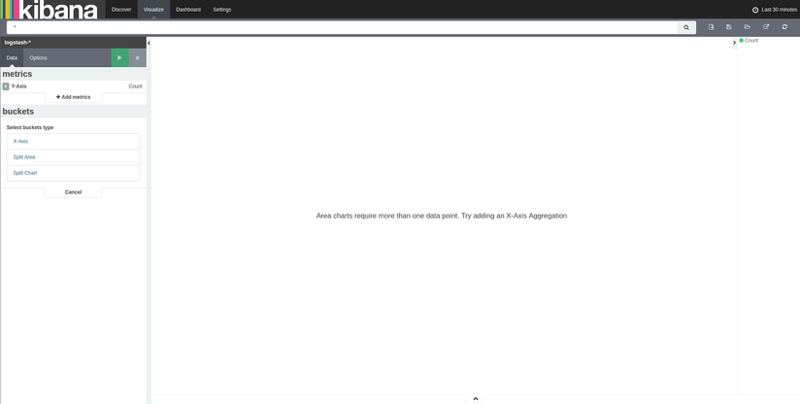 Here, set the field to usedHeapMemoryUsage to and reload the visualisation. 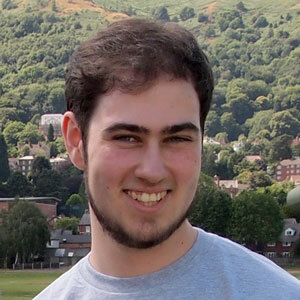 With the JBatch Schedule and Simple EJB Timer example applications deployed, monitoring data might cause the visualisation to look similar to the image below. 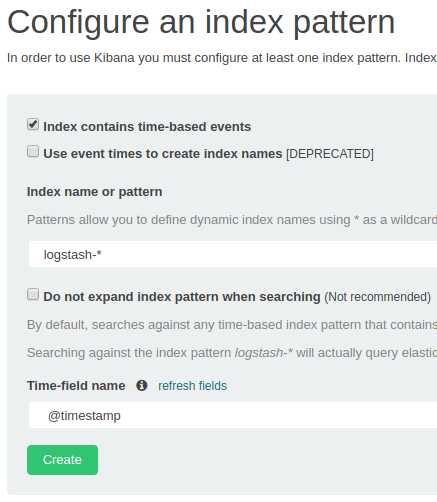 Save the visualisation by using the save item in the top right corner, so that it can then can be used in the Kibana dashboard. The information displayed by the dashboard is determined by the time period set in the top right of the app. The dialogue used to set the time period can also be used to enable auto-refreshing.